Pressure reducing valves for steam and air. A wide assortment of models is available, including pilot-operated models, direct-acting models and models with integral separators and steam traps. Pilot-operated pressure reducing valves with built-in separator and trap. Local-set and remote-set types are available. 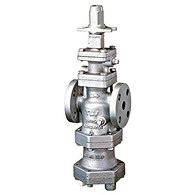 Pilot-operated pressure reducing valves to supply steam or air with stable secondary pressure for general use. Local-set and remote-set types are available. Compact, light-weight, direct-acting pressure reducing valves. Stainless steel construction. Valves for controlling steam or air pressure. They maintain the prescribed pressure even when flow rates fluctuate. Selection can be made from a wide assortment of models, including pilot-operated models, direct-acting models, and models with integral separators and steam traps. High-precision pressure reducing valves for process applications employ a separator with steam trap and shock-absorbing spherical piston to yield a superior flow rate. The basic configuration of pressure reducing valves for air is identical to that of those for steam; as such, they are able to offer the same benefits. For steam transport lines, heaters, etc. For air piping, air-using facilities, etc.